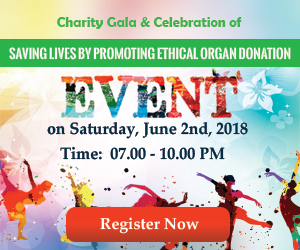 Promoting ethical organ donation & saving lives! MOHAN USA, in association with American Society of Transplantation (AST), organized a special event on the 2nd of June 2018 at Seattle, Washington. The educational event, titled, ‘Strategies to Increase Awareness and Organ Donation Rates Amongst Minorities’ coincided with the American Transplant Congress, the largest gathering of over 5,000 transplant professionals from all over the world, being held in the same city. Moderated by Dr. Anil Chandraker, Past President of the AST, the educational event saw a sold out crowd listen to many speakers present their work on this topic. The opening remarks were delivered by Dr.Anirban Bose, President of MOHAN USA, following which Dr. Sundaram Hariharan enlightened us about the objectives of his organization Transplant Professionals of Indian Origin (TPIO). Ms. Claire Bonilla CEO of SightLife gave a superb talk, bringing into focus, the importance of local cultural sensitivities in the field of organ and tissue donation. Next to speak was Dr. Clive Callendar, the evening’s Keynote Speaker, who delivered an inspirational tale of his life’s work, his journey in the founding of the Minority Organ Tissue Transplant Education Program MOTTEP, the hugely successful program to increase donor registration and organ donation amongst the African American community in the US. He was followed by his protégé, Dr. Keith Melancon, Professor of surgery at George Washington University, who enlightened the attendees on the outcomes of organ transplants among minorities. Next on stage was Dr.Randeep Kashyap, surgical director of Kidney transplant at the University of Rochester, whose research focused on using primary care physician offices as effective enrolment venues for organ donor registration. This was followed by an impassioned lecture by Mr. Kevin O’Conner, president and CEO of Life Center Northwest, the most successful Organ Procurement Organization in the country on the key strategies to increase organ donation and registration. The final presentation was by Dr. Sunil Shroff, founding trustee of MOHAN Foundation, who touched on the salient points about organ donation patterns in South Asia and the local topics and sensitivities that affect it. A lively debate and discussion ensued at the end of the lectures about potential strategies to increase organ donation among minorities, especially South Asians, who have a significant burden of disease, but a low organ donor registration and consent rate. Dr. Callendar’s talk was very revealing as the audience learned how the rate of donations among the black population has risen over a decade due to public engagement and creating community awareness by MOTTEP at the grassroot level. Thanks to their work, the latest UNOS data shows that the rate of donation among blacks is either comparable or better than most ethnic groups in the country. It was also evident that there is very little data in the literature about organ donation and registration rates among the South Asian population. Based on the personal experiences of the experts present at the meeting, it was felt that there is a great need to engage this community in this process and reach out to them at the grassroot level to increase their participation in both organ donation and registration. There was unanimous agreement that it was vitally important to perform more research on this topic and Dr. Callendar and Melancon offered help with their expertise to MOHAN USA to get in step with the logistics of research. MOHAN USA INC. (c) 2017. Registered as a non-profit and tax exempt under IRS 501(c)(3) rules.